Did you know your hubby is your teammate? Husbands and wives are on the same track, working towards the same goal. Even if sometimes they can't agree on how to get there! Working with each other can be difficult sometimes. I think part of it has to do with the fact that we forget we are on the same team. Some nasty traits can pop up and sabotage the team's morale, viewpoint and peace. We know the Bible says it comes before a fall. If your hubby is about to fall, guess what? You are too. And vice versa. Because you are one. Take pride out of the equation when dealing with your hubby. And avoid having to dust yourself off from tripping your marriage up and getting in the way. This is a big one. I think part of every marriage hands out lessons of selflessness. Putting someone else's needs ahead of your own, for the good of them…for the good of the team. When you both get to this point and practice, it's awesome!! But in the meantime, if y'all aren't there yet, make sure you're doing your part to get there. If when you think about yourself, your thoughts don’t consider or include your husband,you might be tipping the scale of selfishness. Whether it's about where you were last Saturday night. Or buying that expensive pair of shoes. Even feeling unappreciated or inadequate. It's so important to be honest. Lies and deceit, as small as we think they are, can lead to massive cracks and holes. Even if the original offense is bad, the added deceit makes it so much worse. Pray for the opportunity and the courage to always be open and honest with your spouse. And that his heart and ears are always soft towards you. Ever been so mad you stop talking? Might even think, at the time, that it's best not to say anything, because your anger will add a sting? Think you'll just walk away and talk later? Then two hours later, you all still aren't speaking? And hours turn into days? This is not good. When we don't communicate, it gives the enemy opportunity to sneak in and misconstrue things, distort things, blow things way out of proportion. If you need to walk away for a time, that's fine. The Bible says to be angry but sin not. And as sharp as my tongue is, I know how much sin words can stir. But the same verse also says don't let the sun go down on our wrath. If you become angry, do not let your anger lead you into sin, and do not stay angry all day. We have to be careful to keep the main thing, the main thing, and not get so engulfed in our feelings that we allow too much time to pass before we fix things. I love my family and I love my friends. I also love my in-laws and my hubby's friends. But they don't have a place in our day to day living. We don't normally consider their input, they aren't allowed to talk against or try to discredit one of us. In other words, while we love them dearly, our first goal is us. They are not allowed to cause division. And anyone that tries gets shut down. Quickly. Even when they have the best of intentions. It's not healthy for everyone to know your business. It's easy for them to hold it against your spouse, even after you've moved on. It's not healthy to involve them in the decisions for your family. After all, it's your family, and you will have to live with the consequences of said decisions. Every day, on every situation, during the good the bad and the ugly, remember that he is not your enemy. He is your husband. Do what you know to do, keep the negativity out, and trust God for the rest. Even if he is acting like you are his enemy, God can work on his heart. While you wait on that, keep on being great. Reflect on your ways, and do better with each new day! 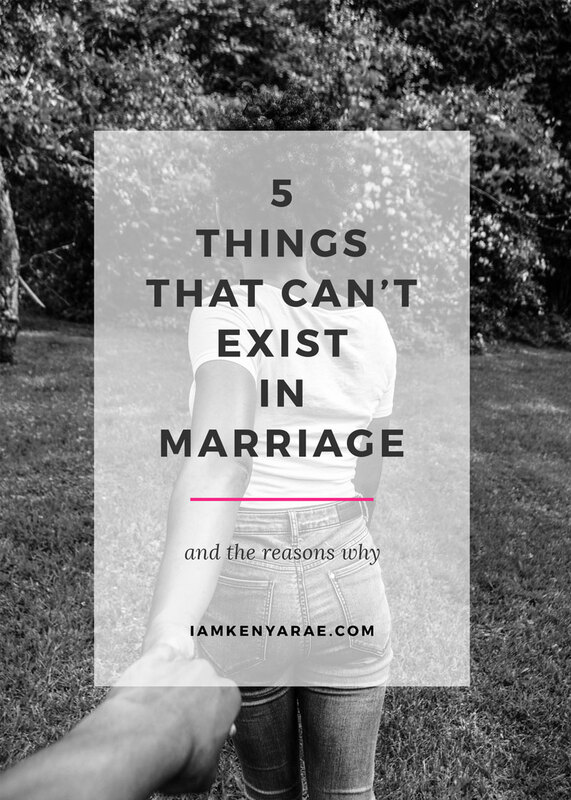 Is there anything that you can think of that do not belong in your marriage? Share your thoughts in the comments below. Yes! I agree to all of these. We often think lying about the little things is ok, but it isn’t! Lying about the little things that don’t even matter can be worse than lying about the big things! You really hit the nail on the head with these!!! I like that you mentioned the silent treatment/cold war. It’s one thing to take some time, it’s a whole other ballgame to leave things unresolved! Yes to all of these! 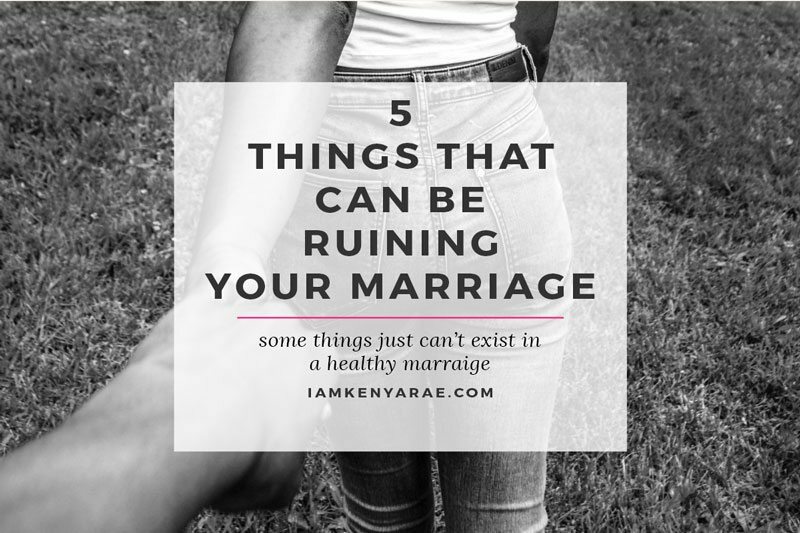 I know quite a few couples who need to see this list. I’ll be sharing in hopes of them checking it out. Yes, and I’m working on most of these every day. The only thing I would disagree with is the friends issue-although for the most part I totally agree, family and friends should be kept out of your marriage, but I’m pretty sure if I didn’t have that one friend to vent to about relationship issues with I would likely be divorced by now (and instead I’ve been married for 18 years). I love that you talked about how friends and family input is nice to know but doesn’t belong in our day to day. I think we often times try to please everyone and we just cant. Excellent points! I totally agree on the selfishness and deceit points especially, they create such barriers in relationships. Amen to all of these! Especially the bit about friends and in-laws. Sometimes you just have to keep folks out of your business! Great post, Bijee! Cold wars and silence…I agree so much! I’m the type of person that has a hard time talking when I’m upset but in marriage it causes more problems. I’m grateful that my husband is patient, it’s something I’m working on:) Thanks for sharing! I loved and completely agree with everyone of these. The in – laws really struck home with me. Our first year of marriage we went from never having a single fight to having a major showdown once a month and it was always regarding in laws. I think that first year is hard for everyone learning new boundaries though. But, once you start to focus on the husband and wife team first it falls into place. Great article! These wise words are golden. Well Done!